Popularly known as Indian Engineering Services (IES) or Engineering Services (ES) conducted every year by the Union Public Services Commission (UPSC). The Examination constitutes of written examination followed by an interview for personality test. Qualified candidates work under the government of India to manage a large segment of public sector economy which constitutes of Railroads, Public works, Power, Telecommunications, etc. Engineering is considered as one of the toughest exams in India as well as in the world due to less number of posts having a selection ratio of 275/10000 (based on 2010 exam results). published in the Employment News/Rozgar Samachar are eligible for age relaxation. Check>> Additional Technical Subjects as per New ESE Syllabus for all branches. 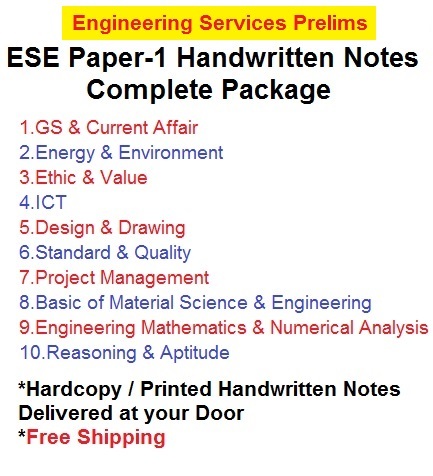 ESE Prelims Paper-1 Handwritten Notes Package@Rs750 Only. Sir ,are these notes are Made easy hand written notes.??? Sir i want only ict notes. What is difference between v 1.2 and v 1.3? Which one among these is for ese 2019 or in other words the latest notes?